Today we remain at the same camp in the Ritter Lakes Basin, where we have observed the Sabbath and enjoyed a reprieve from carrying heavy packs. We are camped at 11,000 feet or I which makes a nice jumping off point from which to explore even higher places. So after breakfast, I climbed along the Class 2 benches on Catherine Lake’s south shore and exited a short screen gully onto the Ritter Glacier. After crossing it’s lower flanks, I skirted most of its bullet-hard blue ice and climbed it’s lateral moraine to the Ritter-Banner col, at over 12,000 feet. I spent some time exploring the Class 3 entrances to each of the two gullies splitting Ritter’s ominous north face, including the “right” gully that Muir climbed on the peak’s original ascent in 1872. During my recon, I wandered across a vintage, button-up, knitted wool sweater made by the Olympia Knitting Co. (its silk label was still intact) that may have been worn by a climber more than 50 years ago. I wondered about the fate of the climber. Ritter’s north face has seen its share of serious accidents through the years and the entire basin is filled with unspoken history, from old sardine tins to unmarked grave sites. After descending back to the col and snacking on a few pilot crackers, I took advantage of the warming sun to explore the Ritter Glacier, its surface now soft enough to ensure reasonable safe traction in my approach shoes. Upon returning to Catherine Lake, I observed a large plume of smoke billowing up over the crest of Glacier Lakes Pass. It seemed close enough to our exit route that I posted a request on Instagram for info about it with a photo of the plume, and learned that it was a new fire started yesterday near June Lakes that is threatening structures and forcing evacuations. For now, we will take it day by day but don’t expect our exit plan to alter. We spent the rest of the afternoon in camp seeking shade from the blazing sun inside a deep cleft in a massive slab that was large enough to house the three of us comfortably. I swam and bathed in the lake, laundered my trekking clothes, took some photos, read a few chapters in a Louis L’Amour novel and a John Muir essay, journaled, did some bouldering around camp, and took an evening hike to scout the beginning of our descent to Twin Island Lakes tomorrow. Our route will take us through convoluted and complicated terrain with slabs, cliff bands, and gullies, and should provide no shortage of Class 2-3 scrambling entertainment. As our layover day ends with the dark night sky filled with a zillion stars, I’m excited to see what lies north. 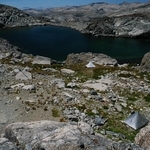 – Our camp in the Ritter Lakes Basin as seen from the cliffs above. 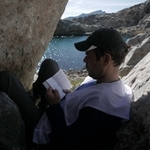 – Daniel finding a shady reading nook in a rock cleft during the heat of the afternoon. 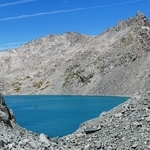 – Catherine Lake as seen from the Ritter Glacier.